Nate Silver furnishes a compelling answer to a good question. Why, he asks, does the Republican base bristle at the inauthenticity of Mitt Romney's conservatism while it readily acknowledges Newt Gingrich's ideological authenticity. That's a good question because Gingrich has taken as many heterodox positions as Romney, and even some of the same ones (e.g., in favor of an individual health insurance mandate and doing something about climate change). The larger red circles represent the House sessions over which Gingrich presided as Speaker. Seeing all this laid out before us, it's hard to resist the conclusion that the Gingrich insurgency represented a genuine tipping point in the ideology of the chamber. And since the House is the most democratic branch of the federal government, it's arguably the best measure we have of the ideological composition of the country as a whole. It's not just that the Gingrich insurgency moved the median House member drastically to the right--the Democratic victory in 2006 effected a larger movement from right to left. Yet as impressive as that leftward movement may have been, it was obliterated by the election of 2010. The Gingrich insurgency had staying power inasmuch as, after a slight retrenchment in 1998, the ideological position of the median House member shifted considerably to the right in the next three elections. It arguably shifted the ideological center of gravity of American politics in a way that Democratic victories in 2006-8 clearly haven't. That's all the more impressive when you compare the House sessions of the Gingrich and post-Gingrich years to those of the Reagan and H.W. Bush years. We think of Reagan as a transformative president who shifted the nation's ideological center of gravity substantially to the right. 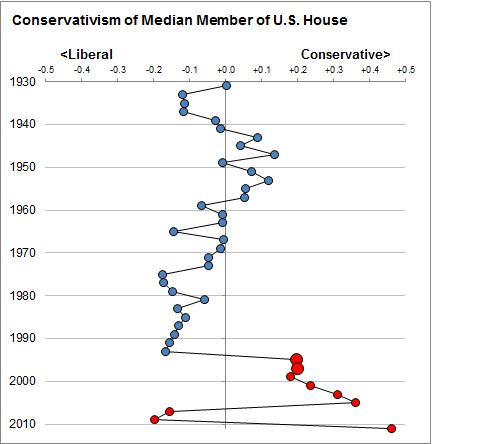 And it's true that his coattails moved the median House member noticeably rightward in 1980, but that still left him on the liberal side of the graph. Moreover, even that rightward movement was virtually wiped out in 1982 and the median member moved noticeably leftward in each election from 1986 through 1992. It doesn't much matter whether we say that, ideological speaking, what we think of as the Reagan Revolution was really the Gingrich Revolution, or that Gingrich was just the most effective executor of Reagan's conservative legacy. In either case, Newt was there at the moment in the evolution of our political culture when conservatives really started believing that they could win, and liberals really started fearing that they might lose, their ideological war. Evidently, that makes up for a lot of heterodoxy in conservative circles.